Plans to restore this iconic landmark at the capital’s entrance have been in the pipeline since 2011, but works only started a fortnight ago, partly due to delays in the tendering process. 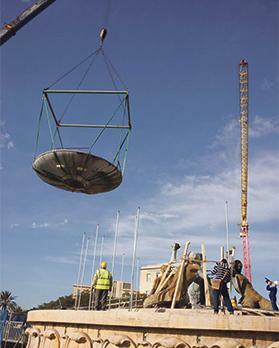 Sea Fountain One, the joint venture awarded the direct order for the restoration work, is now racing against time to complete the works – originally scheduled to take two years – in 11 months, in time for the Valletta 2018 events. 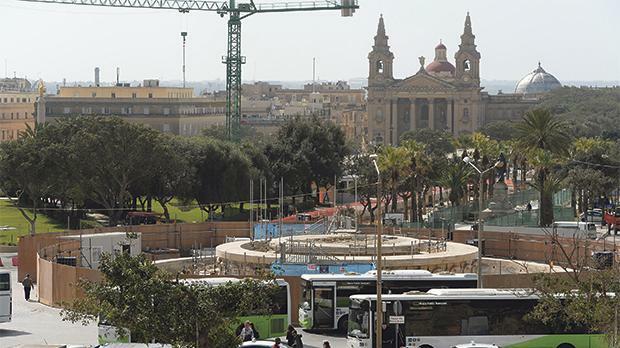 In 2011 the project, meant to be incorporated in Renzo Piano’s Valletta plan, was budgeted at €2 million. However, at a recent news conference marking the start of works, it was announced that the cost had doubled. Following repeated enquiries from this newspaper, an Infrastructure Ministry spokeswoman has attributed the upward revision in the budget to the poor condition of the fountain, which she said was worse than previously thought. Initial estimates had to be adjusted to a more “realistic” figure, in the region of €4 million, due to an expansion of the scope of works which “had not been foreseen”, the ministry said. “The extensive damage to the artistic bronze works, including the fact that the internal parts of the statues were filled with concrete, necessitated the transportation of the bronze structures to Italy and their restoration at a foundry,” it added. Moreover, the bronze basin supported by the three Triton figures needed to be recast due to the extensive warping suffered following its collapse in 1978. A closer inspection of the structure itself also revealed that the travertine slabs forming the fountain’s radial layout had sustained more profound damage and staining than originally thought. Consequently, this required onerous specialised labour-intensive restoration and a range of treatments, the ministry said. Similarly, this newspaper was told that the installation of new water and electricity fittings would involve much more engineering work than expected. The plant and equipment require a new and larger plant room and substation, as well as an underground tunnel linking the new plant room to the existing pump room, which will be enlarged. “It should also be noted that the new plant room must be built on a system of piles, since coring tests have revealed unstable ground conditions,” the spokeswoman said. Apart from the daunting restoration job, the tendering process has also come under close scrutiny. In November 2015, a pre-qualification questionnaire was issued by the Contracts Department for prospective bidders for which four submissions were received. Trident Joint Venture, The Fountain Workshop Limited from the UK, Fonderia Artistica Ferdinando Marinelli from Italy and local firm MT. R Contracting Limited made submissions. However, none of them was deemed to be “administratively” compliant. With the clock ticking for the start of the V18 events, it was decided to hold what is known as a “negotiated procedure”, with a joint venture from the four bidders. However, questions were raised when it emerged that the name of this joint venture, Sea Fountain One, was not among the parties who had earlier shown an interest in doing the job. Asked to clarify the matter, the ministry said the joint venture was composed of the four bidders, with the Italian firm being the lead partner, in line with the Contracts Department recommendation. During the subsequent negotiated procedure, one of the companies opted out. None of the remaining parties in Sea Fountain One entered the scene at a later stage, the ministry pointed out. 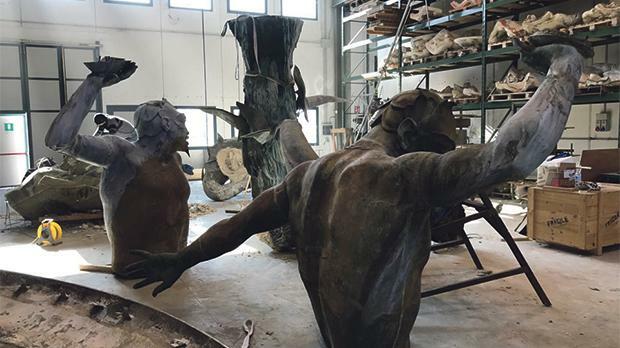 Founded in 1905, the world-renowned, Florence-based, Italian foundry has been commissioned to do various bronze works during its existence, ranging from the Foro Italico in Rome in 1932, the Naiads figures at the UN headquarters in New York in 1968 and the Kremlin Hall restoration in 1998. In turn, De Feo Restauri of Rome has been commissioned to restore the stone works, while the hydraulic and electrical systems have been entrusted to COGE Impianti of Gela. Joseph Scicluna, who forms part of the Projects Monitoring Unit within the Infrastructure Ministry, is the project manager and not Kenneth Cauchi as erroneously stated in recent weeks.